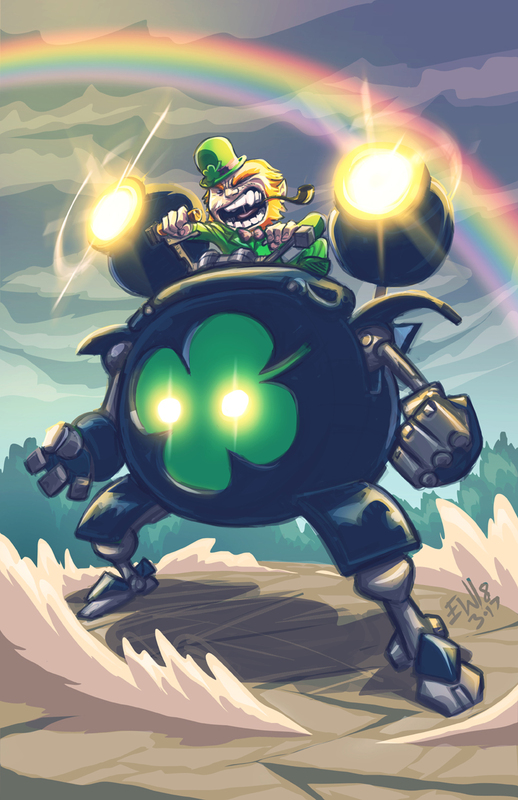 If your lucky enough to find the end of the rainbow, prepare to battle the leprechaun and his cauldron mech for the gold. Going to need all the lucky charms you can muster. Inkscape drawn, photoshop 6.0 colored - 4-5 hours round about. Hope everyone had a safe and happy st patricks day. I'm off to get some pizza and green beer. Ok. Normal beer. As of this post, all art sent! Thank you to everyone who came out and made the DRS Sub Special a special one! We did a 6 hour stream devoted to subscribers to my twitch channel ( twitch.tv/eryckwebb ) raffling off free drawings all day. Was super fun. We raffled to pick each new person to draw for. If they were Tier1 they got a 5 minute drawing. Tier 2 got 10 minutes of draws and Tier 3 got 15 minutes. There were a handful of Tier 2 and Tier 3. Most of these were Tier 1. I really got good at doing these requests in 5 minutes. I haven't drawn that fast in a long time. 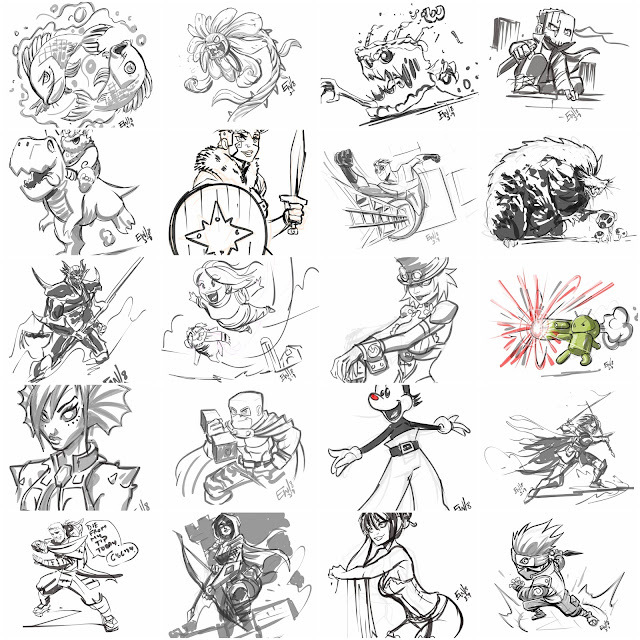 Was super fun and we ended up with 22 different drawing requests over the course of the 6 hour special stream. Only 20 are shown above as I forgot the 21st one ( Sorry Excide ) when sending the art. The 22nd one was 5 more minutes of refinement and sauce on the girl in the lingerie piece. Thank you so much. I wasn't sure how it would go as Ive never done this specific type of stream before. But I was super flattered and encouraged by the response. People donated and subbed and supported with bits anyway just for supporting the stream and it meant a lot. Because of how fun it was and everyone's response we'll definitely make this a monthly thing for subscribers. I plan on the 2nd Friday of each month doing a similar thing for the monthly support. Thank you for supporting what I do! I would not be doing any of this without the crEW, the Requesteers the trEW believers the lurkers the hosters and the fly by viewers! Enjoy the 2 hour clip below, some spots are muted by twitch audio copyright blockers. But the whole video is there and audio is mostly intact especially in the parts that matter. Enjoy! And see the trEW believers and EW crEW out back next week for more Drawing Request Show and Upgrade Action! As of this post, all art sent! Heres today's work that got done. Inked/ Colored six commission upgrades this morning. And drew a handful of fun requests this afternoon as well. Thanks to all who came out and enjoyed the arts and shenanigans. See you all tomorrow for more! Don't forget, Subscribers will want to come out Friday afternoon for a special Sub drawing stream. 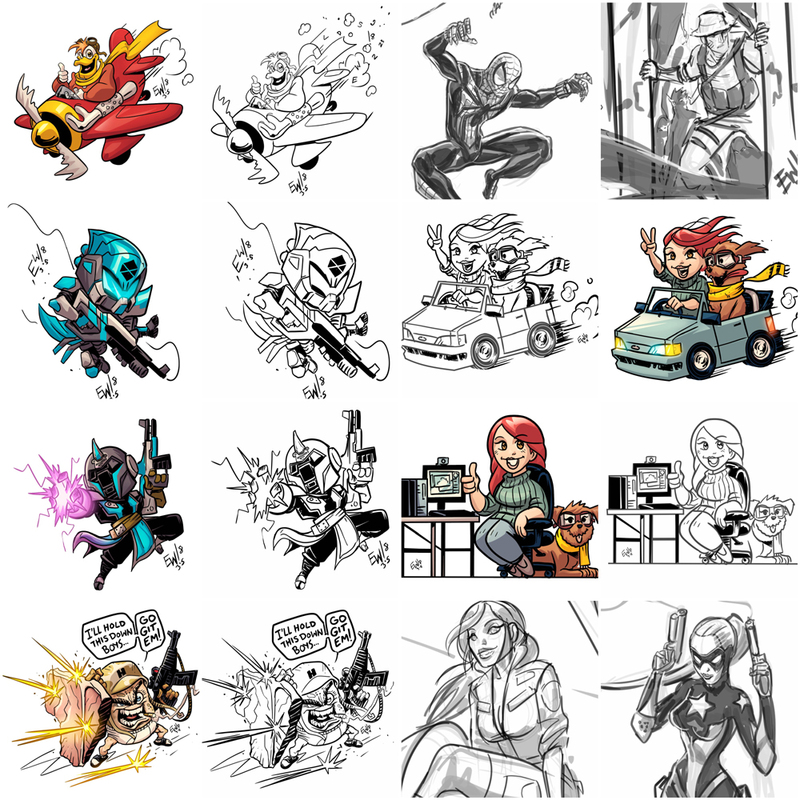 This month's subs will enjoy getting free drawings all day there and then separate from the normal request list. And there will be sub-only giveaways as well. All month, theres a special Pot Of Gold Prize on the Giveaway wheel. When a lucky winner lands on this space, something cool will happen. To find out what, come on out and try your luck at a giveaway! Look forward to drawing for you! Upgrades are every morning this week 9amET and Drawing Request Show 2pmET every afternoon!